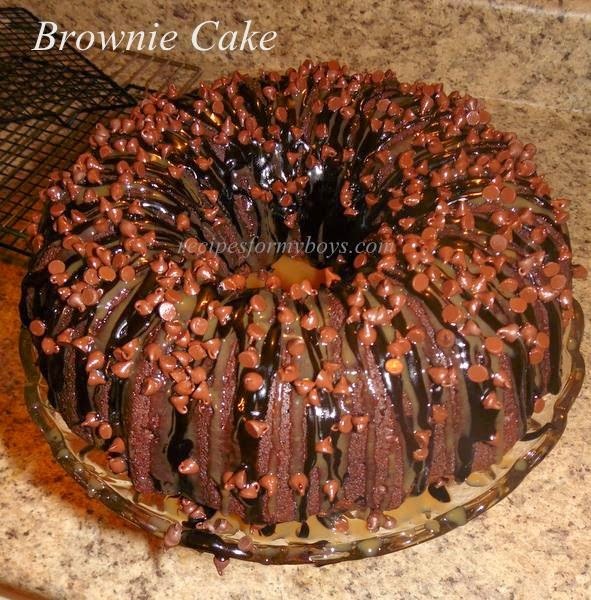 Top with all your favorite toppings, like a package of chocolate syrup included in the brownie mix, caramel sauce, mini chocolate chips,.... Pecans added could make it a turtle brownie cake! Preheat oven to 325 degrees F. Spray bundt pan with non-stick spray, I use Pam. In70 a mixing bowl, whisk eggs and oil together. Stir in 1 chocolate syrup packet (reserve the other) and buttermilk. In another bowl, whisk together brownie mixes and pudding mix. Stir wet ingredients into dry ingredients. Stir in sour cream just until mixed. Pour in greased bundt pan. Bake in preheated oven 60 to 70 minutes (checking at 50 minutes and every 5 minutes) until toothpick inserted comes out clean. Cool 10 minutes on rack. Run a plastic knife around edges. Remove from pan and cool. Top with caramel sauce, remaining chocolate syrup package and mini chocolate chips. Chocolate syrup packets are listed in ingredients. What size?